THE boiler of ‘Merchant Navy’ No. 35028 Clan Line passed its out-of-frames steam test on March 4. 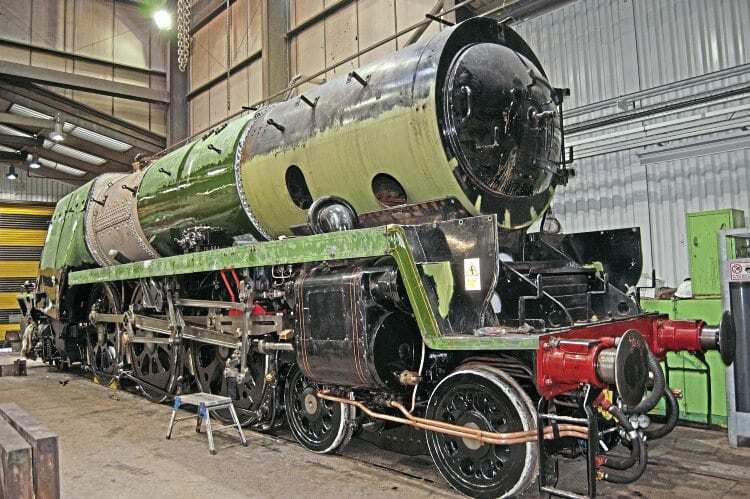 This development paves the way for the Merchant Navy Locomotive Preservation Society to begin main line testing sometime during April. The test took place at LNWR Heritage, Crewe, with preparations beginning as early as 04.30. Initially, the first safety valve was set to lift at 260psi for steam test purposes, 10psi more than the Pacific’s working pressure of 250psi, but 20 less than the class’ original boiler pressure of 280psi. All was deemed to be in order and the boiler inspector confirmed that he was happy and the boiler passed. Work has now turned to the smokebox, which has had the bottom half replaced owing to corrosion. This still requires riveting to the barrel, but the assembly has already been lifted onto the frames for the smokebox fixing holes to be marked. Once lifted again the smokebox can be permanently fixed to the barrel, after which the superheater header and elements can be installed. Work on the three steam pipes will follow.